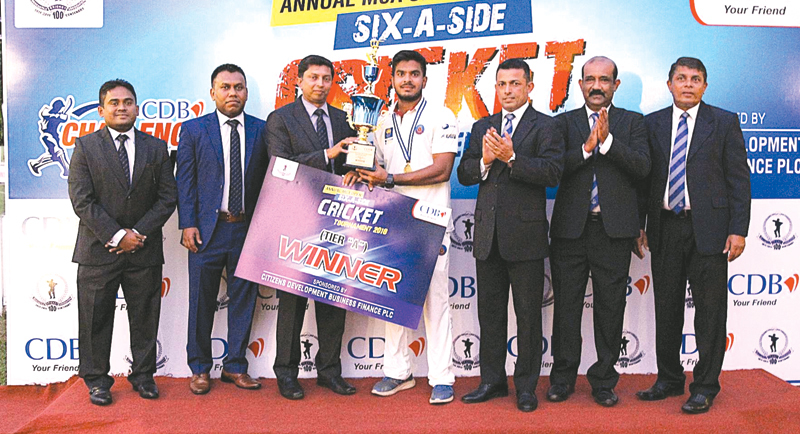 LB Finance ‘A’ led by Angelo Perera and Fairfirst Insurance led by Lakshan Perera lifted the ‘CDB’ Trophy, as they emerged winners of the MCA Open ‘Sixes’ Tier ‘A’ and Tier ‘B’ Tournaments respectively, at the MCA Grounds recently. LB Finance beat Commercial Credit in the Tier ‘A’ final and Fairfirst Insurance beat Allianz Insurance in the Tier ‘B’ final. The tournament with participation of 69 teams – 21 in the Tier ‘A’ (turf) and 48 in the Tier ‘B’ (matting) were played over three days on September 07, 08 and 09. Tier ‘A’ final: Commercial Credit batting first scored 78 for 2 in their 05 overs, riding on 02 good knocks by Sandun Weerakkody (28 with 02 sixes and 03 fours) and Wanidu Hasaranga (25 not out with 03 sixes). LB Finance reached their target with 02 balls to spare (79 for 4 in 4.4) as Sahan Arachchige (26 with 06 fours) and Sadeera Samarawickrama (26 not out with 01 six and 04 fours) targeted Commercial Credit’s 02nd and 03 rd bowlers Dilshan Munaweera and skipper, Ashan Priyanjan, both giving away 23 runs each. Special Awards : Best Bowler – Sampath Perera from Fairfirst Insurance. Best Batsman – Lakshan Perera from Fairfirst. Most sixes in the tournament (12) Sameera Fernando from Allianz Insurance. 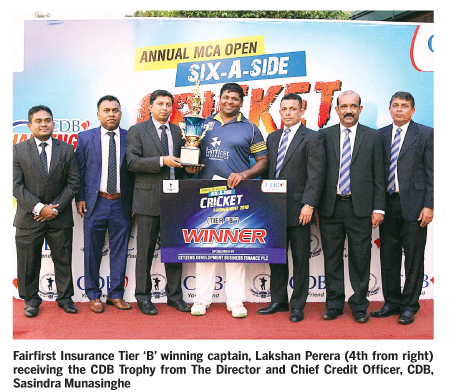 Man of the Final – Lakshan Perera from Fairfirst Insurance. Man of the Tournament – Sameera Fernando from Allianz Insurance. LB Finance ‘A’ 79/4 (4.4) (Isuru Udana 15, Sahan Arachchige 15, Sadeera Samarawickrama 26 not out, Dilshan Munaweera 1/23, Lahiru Madusanka 1/10, Wanidu Hasaranga 1/10). Special Awards: Best Bowler – Wanidu Hasaranga from Commercial Credit. Best Batsman – Sandun Weerakkody from Commercial Credit. Most Sixes in the tournament (12) – Isuru Udana from LB Finance. Man of the Final – Sahan Arachchige from LB Finance. Man of the Tournament – Isuru Udana from LB Finance.